The Shanly brothers, Walter(1819-1899) and Francis(1820-1882) were Irish-born civil engineers, who worked mostly on railways, and came to British North America in 1836, settling on a farm near Thorndale beside the Thames River north of London, Upper Canada. The Shanly brothers disliked farming and eventually searched for employment that was more in keeping with their gentrified upbringing. Walter’s first railway related job was in 1846 surveying for The Great Western Railway. Francis headed to the US and found work with the Ogdensburg and Lake Champlain Railroad, learned on the job, and picked up the basics of railway construction. In 1851, shortly after returning to Upper Canada, the brothers began work on the Toronto and Guelph Railway, which in 1853 became the part of the Grand Trunk Railway. When the GTR was extended through to Sarnia, Walter stayed on as chief engineer. In that role, Walter authored a report that determined the present day location of Toronto’s Union Station. 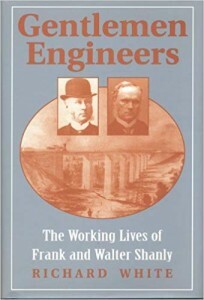 During the early to mid-1850s, both Frank and Walter continued surveying and building rail lines throughout Upper Canada, and from 1858 to 1862 Walter worked out of Montreal, as the general manager and chief engineer of Grand Trunk. After serving as a member of Upper Canada’s Legislative Assembly from 1864 to 1865, Walter went on to serve as an MP in Canada’s first parliament from 1867 to 1872. While serving as an MP Walter advised his close friend, Sir John A. Macdonald on railway related issues and lobbied for the adoption of a universal gauge. In 1857 he was instrumental in establishing the School of Engineering at what is now McGill University, and in 1887 helped found the Canadian Society of Civil Engineers. Named a “Historic Civil Engineering Landmark” by the American Society of Civil Engineers in 1975, the completion of the Hoosac Tunnel in Western Massachusetts is by far the brothers’ most spectacular feat of engineering. Completed in 1875, like many of the Shanly-built railway structures, the 4.75 mile tunnel, through the Hoosac Mountains, is still in use today. Sadly, as he neared the end of his life, Walter Shanly considered himself a “failure” although, throughout Ontario, many of the structures he and Francis built still stand as testament to Walter’s belief in “the inseparable alliance of utility and aesthetics”. He’s buried in St. John’s Cemetery at Arva, just outside London, ON.